I've done a Video project using a DVD Camcorder. It was a nightmare. Read on. I videoed a showcase production for a friend last Saturday using a Sony DVD91E Camcorder. Aside from the low quality - which was even worse than normal because I had to use LP mode - you have to bear in mind that the disks will act as gyroscopes when you move the camera - they will be extremely sensitive to camera shake and twist. So, I finished the filming and took the disk home. It was an 8cm disk so it doesn't fit in any slot-loading Mac - I had to use an old iBook. But it thought the disk was blank! Turns out the DVD needs 'finalising'. so then I asked a teacher friend from Ivy Cottage who's school had a DVD camcorder which I picked up on Wednesday. I finalized the DVD (which meant I ended up holding the cam perfectly steady in my hands for 3mins, because it put up a dialog box saying "Finalizing: Do not subject the camera to ANY vibrations." but only after I selected the option (Grrr!!)) Then the disk was too dirty to read properly on the mac, so it took a bit of cleaning. I finally copied the files from the disk, but of course, I can't import them into iMovie, because it's DVD .VOB files not QT movie, .avi or .dv files. It took lots of faffing about until around 11:30pm until I got FFMpegx to convert the file to .dv format (import to iMac, create disk image, create DVD, fix DVD image and recreate etc, download FFMpegx and libraries...). Awful. In 7 years I never had any problem like that with a tape-based system. Just plug it in, import video. Off I go. I hope Christmas preparations are going well. Santa needs to bring you an AngelicVD Camcorder. 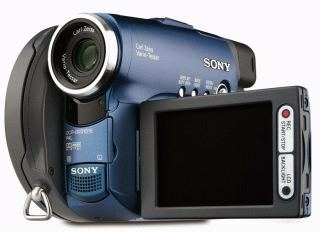 Nice sharing for your experience of using camcorder. thanks.